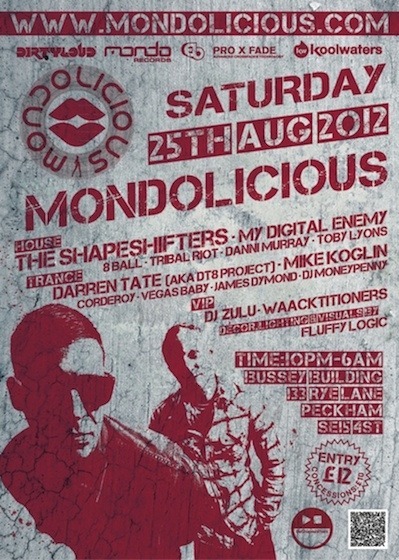 Come celebrate the first of Mondo Records' three nights at The Bussey Building. A no-nonsense warehouse party with two floors dedicated to the greatest in house and trance! Headliners, The Shapeshifters will be in the house room while legendary DJ, Darren Tate aka DT8 performs for the trance fans!!! d trance. It promises a unique clubbing experiencing across two floors with stunning 3D visuals, and a themed VIP cocktail lounge. The club night will be held at the The Bussey Building, one of South London's fashionable new venues located within the celebrated center for creative arts in Peckham Rye. With headline DJs at the forefront of dance music, it will be a night not to miss! The Shapeshifters, house music's revered DJ and producer duo, are finally back in London for all their fans in the capital. After a successful 2011, with highlights including a major collaboration with the legendary Frankie Knuckles, and a hectic international DJ schedule to date, these champions of house will be supplying the Nocturnal Grooves for our late night party. Harry Diamond, Sergei Hall and Keiron McTernan, are My Digital Enemy, the trio responsible for the monster that is ‘Take Me With You’ with Prok and Fitch, and their phenomenal reworking of 'Rocker' by Alter Ego which hit number 1 on the DMC Buzz Chart. Expect a progressive tech house storm to shatter through the dance floor. Acclaimed DJ, producer, and director of Mondo Records, Darren Tate adds Mondolicious to his list of contributions to dance music both at home and internationally. Undoubtedly one of London's premier DJs, Darren Tate's sets encompass the knowledge of a prolific artist and expert producer of his caliber blending genres from trance to progressive house. Bringing his dynamic and energetic style to the night is the Grammy nominated DJ and producer, Mike Kolgin. Combining trance with elements from electro and techno, his sets contain the high-octane mixes and original tracks that have placed him in DJ Magazine's annual Top 100. One of the most well loved up and coming names in dance music, Corderoy is known for being an innovator in the scene and with Give Me a Reason, his latest mix with Judge Jules, storming up the charts Corderoy continues to push the envelope for dance music. Definitely an unmissable set. MoneyPenny aka Si Evans, brings an uplifting style of mixing that touches on all elements of House, Techno & Trance. Be prepared for booming bass, euphoric vocals & spine tingling drops. You are going to be hearing a lot more from this man, and he will most definitely see you on the dance floor! DJ Zulu - The best 'Funk Off' Party rocking the Disco, Funk and Club Classics with a touch of the boom bap! Waacktitioners - a stunning and stylized dance crew influenced by disco, drama and high fashion bringing an exciting look back into the disco and funk era's of the 70's.